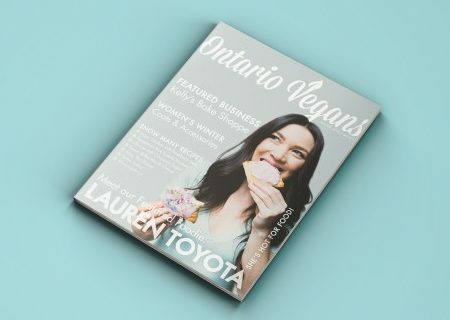 Whipping up some fluffy vegan crepes could not be any easier! The batter is just 5 simple ingredients and you can stuff ’em with whatever you like. You’ll need a large non-stick skillet (at least 9 or 10-inches wide) or a crepe pan and you’ll get the hang of the swirly twirly pan thing after a couple of times! 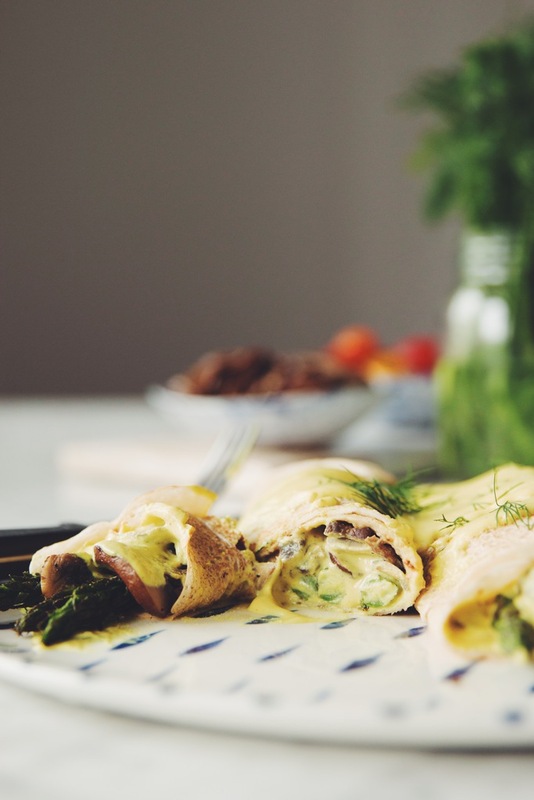 I demonstrate the technique in the video below… and I’m not entirely perfect at it either, but it really doesn’t affect how delicious the crepes are in the end. I’m more of a savory breakfast gal, but you can totally makes these sweet with fruit, chocolate, nut butters, whipped cream, and maple syrup! 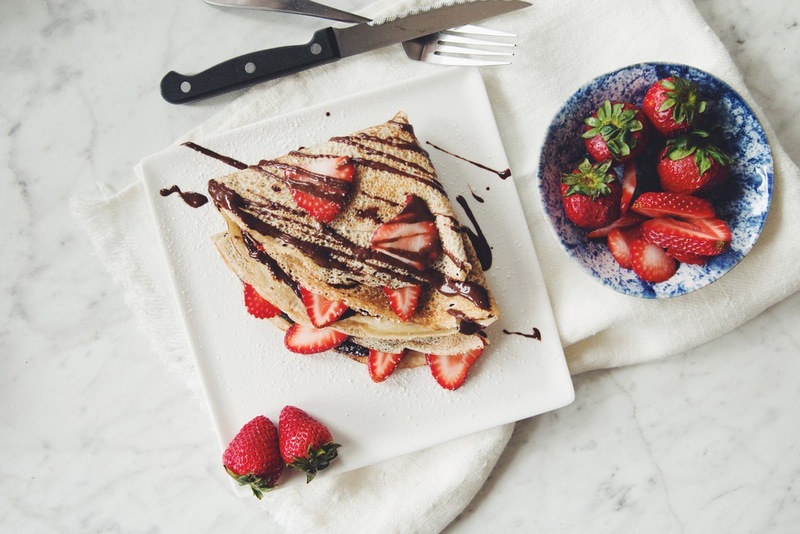 This one is a vegan nutella and strawberry crepe. 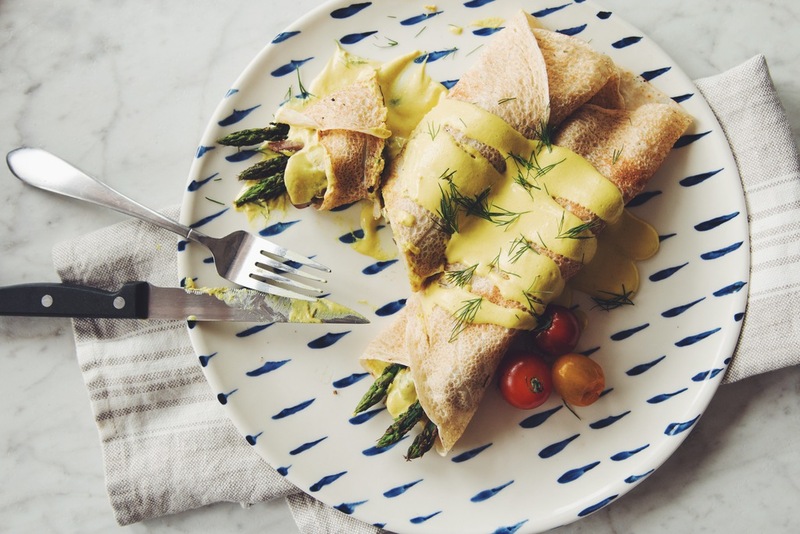 Check here for the hot for food hollandaise sauce and the “00” soft wheat flour listed in the recipe below! 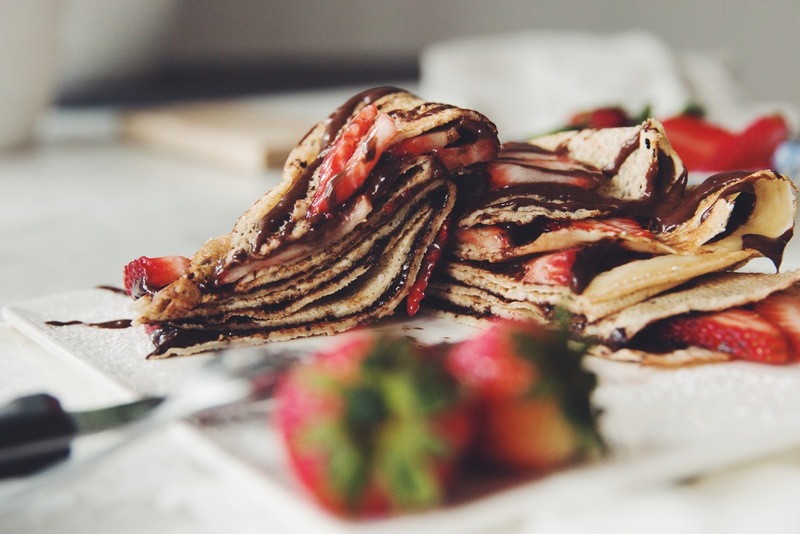 Whipping up fluffy vegan crepes is super easy with a 5 ingredient batter… the best part? You can stuff ‘em with whatever you want! In a large bowl, whisk together flour, sugar, and baking powder. Add in the melted vegan butter and start whisking while you pour in the nondairy milk. The batter should be very thin and loose. Your skillet or crepe pan should be over medium heat. You'll need to adjust the temperature as you go as the pan gets hotter! Pour about 1/3 cup of batter on the pan, lifted off the burner. As soon as the batter hits the pan, twist and turn the pan in large circles to make a thin layer of batter in an even circle just out to the edge. After about 1 to 1 1/2 minutes, you'll notice the sides of the crepe starting to lift off the pan. 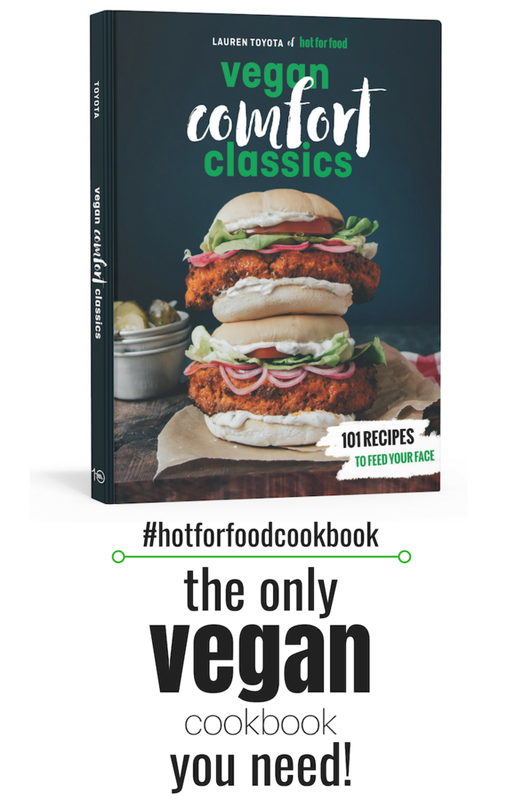 At this point you can flip it with a large spatula. Let it cook for another minute and then remove onto a large plate and cover with a tea towel to keep warm. You can also reheat the crepes in a low temperature oven (about 200°F) before assembling crepes for serving. Cook mushrooms in the same pan or a cast iron skillet over medium heat with 2 tbsp olive oil for about 5 to 6 minutes. Once they're about halfway cooked through, add minced garlic and sauté for another 4 minutes or so. Remove from the pan into a bowl you can cover to keep warm. Wipe out excess liquid or residue in the pan and get it to medium-high. Add trimmed spears of asparagus in one layer across the pan. Sear on one side for 3 minutes. Season with nutmeg and smoked paprika and then flip, searing the other sides. You'll only toss once or twice as you're trying to char the asparagus in a hot dry pan until just tender and bright green. The total cook time for these is about 6 minutes. Just before serving, heat up the hollandaise over low heat in a saucepan, whisking constantly to warm through. Add a bit of water if necessary to thin out. 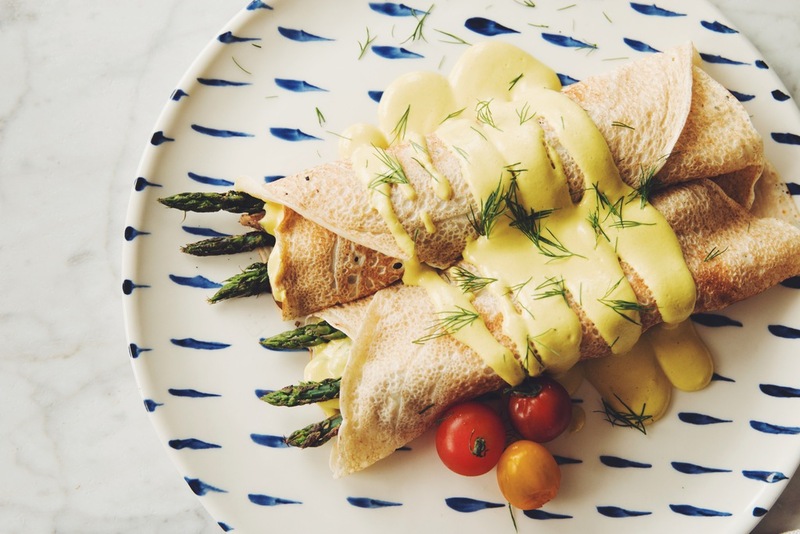 Fill crepes with sautéed mushrooms and spoonfuls of hollandaise. Add asparagus and fold the edges over each other, rolling up the crepe snuggly. Then drizzle with more hollandaise on top and garnish with fresh dill. Serve immediately!